The Japanese Aerospace Exploration Agency will be keeping its eyes peeled tomorrow for some brief fireworks when its Kaguya lunar orbiter slams into the Moon's surface at 6,000 km/h. Since launching in September 2007, Kaguya (formerly called Selene), has probed the Moon's gravitational field, surface and composition, in the process sending back some nice HD video of Earth rise and Earth set via two smaller data relay satellites it deployed on reaching orbit around our satellite. According to New Scientist, viewers can expect a "brief flash" as Kaguya goes out with a bang - coming in at an extremely shallow angle to the ground and possibly skipping across the surface "like a stone across a pond". Kaguya mission spokesperson Shin-ichi Sobue said: "It's a final show for the Japanese people." Scientists may also enjoy a plume of dust thrown up by the collision "like snow thrown up by a skier ploughing through powder", as Bernard Foing, project scientist of the European Space Agency's SMART-1 probe, described it. SMART-1 also ended its days in a high-speed encounter with the lunar surface back in 2006, later followed by China's Chang’e 1. In November last year, India joined the bash-the-Moon club when it successfully fired its Moon Impact Probe as part of the Chandrayaan-1 mission. These impacts are not, however, solely to satisfy space scientists' evident enthusiasm for throwing things at the Moon. Kaguya's demise could produce "an elongated scar, exposing fresh soil, or regolith, to the harsh environment of space". This, says lunar impacts expert Peter Schultz, of Brown University in Providence, Rhode Island, could lead to a new research opportunity as observers "watch how the lunar soil weathers over time under solar radiation and bombardment by smaller meteoroids". 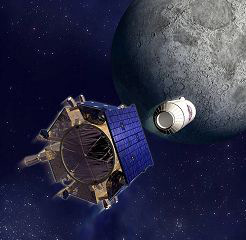 The much-harrassed Moon will next enjoy the attentions of NASA's Lunar Reconnaissance Orbiter (LRO) and Lunar Crater Observation and Sensing Satellite (LCROSS) - slated to blast off together on 17 June. The LRO will "scout for safe and compelling lunar landing sites, locate potential resources with special attention to the possibility of water ice, and characterize the effects of prolonged exposure to the lunar radiation environment". 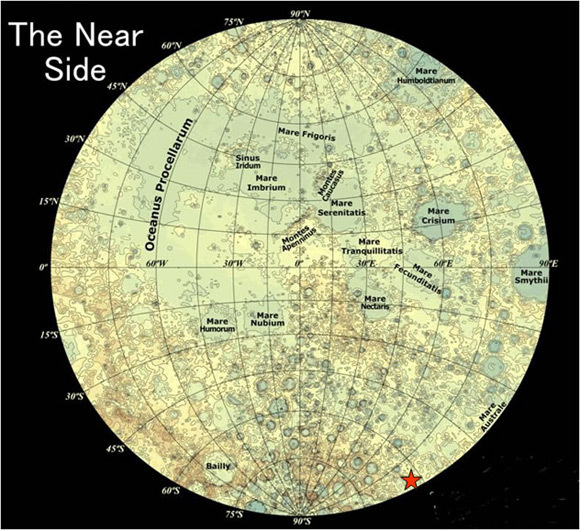 LCROSS, meanwhile, is tasked with sniffing out water at "the permanently dark floor of one of the Moon’s polar craters". Fans of tech-lunar smashes will be relieved to learn the mission includes a Centaur rocket, launched from a "Shepherding Spacecraft" (see pic), and which will whack into the surface "at more than twice the speed of a bullet".